Volume 27 of the Gabriel Wells Definitive Edition of Mark Twain's Works is The Mysterious Stranger And Other Stories. The seven stories in this collection are the same as those found in the first edition of the book issued by Harper and Brothers in 1922 in their Uniform Library edition. Three stories had previously been published by Harper and Brothers as single books: A Horse's Tale (1906), Extract from Captain Stormfield's Visit to Heaven (1909) and The Mysterious Stranger (1916). The remainder of the stories "A Fable," "My Platonic Sweetheart," "Hunting the Deceitful Turkey," and "The McWilliamses and the Burglar Alarm" had been published in magazines during Mark Twain's lifetime. In 1963 the lone posthumous publication in this collection, the lead story "The Mysterious Stranger," was discovered to be a fraudulent version of several of Mark Twain's unfinished manuscripts which were pieced together and rewritten by Albert Bigelow Paine and Harper executive Frederick Duneka. Harper's Magazine serialized the Paine and Duneka version over a seven month period from May - November 1916 and released the story as an illustrated book in October that same year, all the while advertising it as Mark Twain's "only unpublished romance." Nearly fifty years later, Mark Twain scholar John S. Tuckey published his research and revealed the full extent of the fraud. Paine and Duneka deleted about 35 percent of the original text, rewrote many passages, and added to the story the character of the astrologer -- a character never in any of Mark Twain's versions of the story. While no motive behind the fraud was ever established, financial gain for Harper and Brothers likely figured into the publishing scheme. In light of what is known today about the true history behind this work, Albert Bigelow Paine's Introduction to the volume reveals the length he went to in order to convince the public of the authenticity of the work. THE title story of this collection, "The Mysterious Stranger," was written at Vienna, during the early part of 1898. The idea of a wonderworking visitant from some remote realm was one which always appealed to Mark Twain's fancy, and he began a number of stories with this as the central idea. A friendly interest in the character of Satan, the angel fallen from his high estate, prompted him to select a member of that lineage for his hero, a beautiful youth, not wicked, but only indifferent to good and evil and suffering, having no personal knowledge of these things. The author made three extended attempts at this story, and one of them -- the first, and by far the best -- he brought very nearly to conclusion. Then he put these various beginnings away and did not examine them again for many years. "I always had a good deal of fancy for that story of mine, 'The Mysterious Stranger." I could finish it, I suppose, any time, and I should like it some day to be published." Somewhat later I came upon a few notes he had made for the tale's conclusion, but it was not until a considerable time after his death -- after the publication of my biography of him, in fact, that I found among a confusion of papers that tremendous final chapter, which must have been written about the time of our conversation. It may even have been written prior to that time, laid aside, and forgotten, for his memory was very treacherous during those later days. The penmanship, however, closely identifies it with that period. Happily, it was the ending of the story in its first form. The others, though not without fine writing, were lacking in interest, being mainly wanderings in those fantastic fields into which Mark Twain was prone to be tempted. "The Mysterious Stranger" in its completed form was regarded as one of Mark Twain's important productions, and upon its appearance in Harper's Magazine was so recognized by the reading public. That chapters of it should disturb the sensibilities of orthodox readers was to be expected, and especially that final chapter, added in old age. An amazing piece of writing is that conclusion, high-water mark of its kind. Whether we agree with it or not, whether we understand it or not -- and very few of us are likely to do either -- we must turn to it again and again, to read it with a sort of terror and with an ever-increasing awe. There is neither space nor need to enter here into a discussion of Mark Twain's religious beliefs, but it is easy to understand that the early Christian idea of heaven with its pearly gates and golden streets and harps and white wings amused rather than impressed him. As far back as 1868, when he was on the voyage to California, an old seafaring friend, Captain Ed Wakeman, told him a curious dream of a visit to the next world, which dream Mark Twain promptly and gorgeously elaborated into a tale which he then called "Captain Ed Wakeman's Visit to Heaven." Mark Twain was rather fond of shocking his readers, and the publication of the Wakeman story at that time would very likely have jarred upon the nerves of a great many worthy persons. He brought it back from California with him, but he did not publish it. 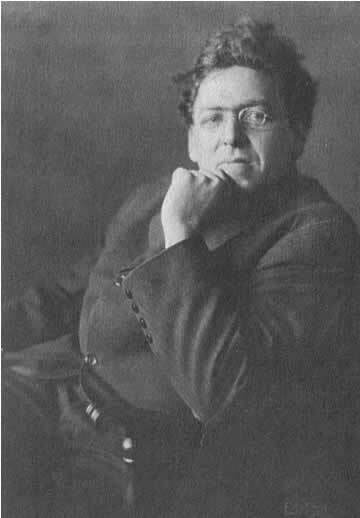 Olivia Langdon, who later became his wife, was already his literary censor, and Wakeman's dream became one of her early prohibitions. She was far from narrow, but she felt, properly enough, the unwisdom of publishing the story then. So it was banished to an ever-growing colony of manuscripts, where it lay lost to the world for a period of nearly forty years. Now and then, when some appreciative visitor like William Dean Howells came, Clemens would get out the Wakeman manuscript and read it aloud, and they would delight in its humor and wish the time for publication would arrive. Howells once went so far as to advise its publication in England, with an introduction -- or at least an indorsement -- by Dean Stanley; but this was probably only semi-serious counsel. At some time during the long period of waiting Clemens changed Wakeman's name to Stormfield, doubtless as being more suitable to his fictitious character. The civilized world saw many important changes in forty years; so many new inventions and philosophies would hardly leave old religions unchanged. New beliefs were promulgated, old beliefs were modified. The newspapers and ministers, between them, banished hell, and even began to suggest that the white wings and golden harps, and the jeweled architecture of the early Christian fancy were to be regarded as symbols of hope rather than as potential rewards. The time for "Captain Stormfield" had come. Mark Twain re-read his extravaganza, gave it a modernizing touch or two, and handed it to his publishers, who must have agreed that it was no longer dangerous, for it was promptly accepted, and appeared in two numbers of Harper's Magazine. If there were any readers who still found it blasphemous, or even irreverent, they did not say so. The letters that came -- and they were a good many -- expressed enjoyment and approval; also, some of them, satisfaction that Mark Twain had returned to his earlier literary form. "Stormfield" is an amusing tale, and Mark Twain often thought of continuing the fancy -- in fact, made some effort to do so. But perhaps the spirit of his first conception was gone, and the fragmentary chapters which he began now and then during his later days did not unite with the original idea. . . . I have lain awake nights very often, wondering if I dare ask you to write a story of an old horse who is finally given over to the bull ring. The story you would write would do more good than all the laws we are trying to have made and enforced for the prevention of cruelty to animals in Spain. We would translate and circulate the story in that country. I have wondered if you would ever write it. Mark Twain replied that he would undertake the experiment, but that he could not tell when it would be finished. He began writing at once and, becoming interested, completed "A Horse's Tale" with very little delay. During the course of the writing he realized that the heroine he had in mind was his own dead daughter, Susy, and, in forwarding the manuscript, sent with it a picture of Susy, asking that the illustrations be made as like her as possible. When it was published, a year later, Mrs. Fiske sent her grateful acknowledgments, and asked permission to have it printed for pamphlet circulation in Spain. Perhaps it is not one of the greatest of Mark Twain's short stories, but its pathos brings tears, and stirs the reader's indignation toward the custom which it was intended to oppose. The title story for Volume 27, "The Mysterious Stranger" first appeared over a seven month period from May to November 1916 in Harper's Magazine. Each month's installment featured a full-page color illustration by Newell Convers Wyeth. The installments and color illustrations were collected and printed as a Harper's holiday edition that year. At age twenty, Wyeth skyrocketed to national attention with a cover illustration for Saturday Evening Post in 1903. In 1911 Wyeth entered into an agreement with Scribner's publishing house to illustrate an edition of Robert Louis Stevenson's Treasure Island. The outstanding success of those illustrations firmly established Wyeth as the foremost book illustrator of his day and led to collaborations with Scribner's for over fifty additional books over the next three decades. 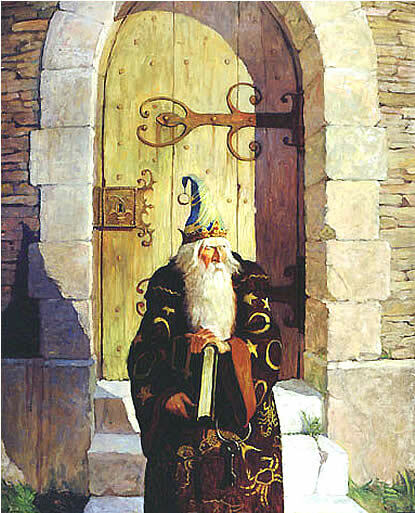 Illustration titled "On the Fourth Day Comes the Astrologer From His Crumbling Old Tower" by N. C. Wyeth was reprinted in black and white for the Gabriel Wells Definitive Edition. Volume 27 features three of Wyeth's illustrations from the original Harper's Magazine publication. The illustrations, originally in color, were reprinted in black and white in the Gabriel Wells Definitive Edition. Wyeth's astrologer, the character invented by Albert Bigelow Paine and Frederick Duneka, is not in Mark Twain's original manuscripts of the story. However, Wyeth's illustration of the astrologer has helped to firmly anchor that character into the national consciousness as an integral part of the original story. Harper's 1916 edition of The Mysterious Stranger remains a favorite with both Wyeth and Mark Twain collectors. Also included in Volume 27 is an illustration by Albert Levering that had originally appeared as the frontispiece of Harper's 1909 edition of Extract from Captain Stormfield's Visit to Heaven. Levering's work had previously been included in all uniform editions of The $30,000 Bequest and Other Stories to illustrate the essay "Italian Without a Master." Michaelis, Davis. N. C. Wyeth. (Alfred A. Knopf, 1998).